South Korean winter is popularly called “snowy season”, which usually lasts from November to March with average temperatures below 0 degree Celsius. The winter there is unique for Vietnamese tourists, as they can have experiences with snow, winter sports and ice fishing festivals that only cold countries have. In particular, after the success of the 2018 Pyeongchang Winter Olympics, more and more tourists know about Korean winter tourism, especially in Gangwon province - the main venue for the Olympics. Arriving in the land of kimchi in the winter, visitors will have the opportunity to admire the magical scenery of the immense white snow, immerse themselves in pure hot springs and take part in numerous exciting, dynamic recreational activities. Ice skating and skiing are the two most exciting activities for all ages. Your Korean winter memories will certainly become unforgettable, livelier than ever when you experience the feeling of sliding swiftly into snow hills or gently surfing yourself on the ice. In winter, many Koreans as well as tourists flock to the ice rink in Seoul Square where you can skate freely outdoors, right in the heart of the bustling city of Seoul, the capital of South Korea. If cold weather inhibits tourists from joining outdoor activities, they can play on an indoor ice rink at Lotte World. This giant ice rink, located on the third floor of the entertainment area, will still give them great experiences and feeling of ice skating without having to play in the ice-cold weather. 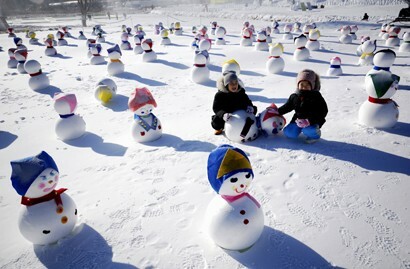 Dropping in on South Korea during the snowy season, you should not miss a series of exciting snow games. One of them is sitting on the floats and sliding along the gentle hills to enjoy the breath-taking feeling when you slide on the snow at a lightning speed. In order to promote the development of tourism combined with the experience of winter sports, the Korea Tourism Organisation (KTO), which is commissioned to promote the country's tourism industry, opened 3-day FUN SKI, VIVA SKI and GO GO SKI skiing festivals for visitors staying at Yongpyeong, Daemyeong Vivaldi Park and High 1, three major resorts in Gangwon province. Joining these ski festivals, visitors also have the opportunity to take part in other Korean cultural experiences such as making Korean dishes, playing folk games and watching music performances. When white snowflakes spread all over Korea, it is time for residents and visitors to excitedly welcome the biggest winter event of the year - Daegwallyeong Snow Festival, annually in Pyeongchang City. Pyeongchang is located in Gangwon-do, one of the places with most beautiful snow and winter scenery in South Korea. This is also the venue of the 2018 Winter Olympic Games. Another festival that hardly any tourist miss when they experience the Korean winter is Hwacheon Sancheoneo Ice Festival with salmon fishing on ice. When the water surface is completely frozen in winter, people and tourists will flock to streams, cut small holes on the ice together to begin fishing. In the freezing winter, people seem to forget the cold weather in exchange for warm greetings and participate in countless other ice activities such as traditional skating or ice riding. According to the KTO Representative Office in Vietnam, Vietnamese tourists to South Korea are expected to reach 450,000 in 2018, more than 40 per cent higher than in 2017. To bring more new experiences for Vietnamese tourists, KTO is promoting the development of new tourism products combined with skiing and winter festival experiences together with many prestigious travel companies in Vietnam this year. Hopefully, this will be a positive development for Vietnamese tourists to have more quality products when they travel to South Korea.